The concept of lickable wallpaper is nothing new, thanks to Willy Wonka. But it hasn't exactly spread like wildfire. After all, what about all those germs? Individuals at a communications building in London are in fact the first to experience lickable wallpaper on an elevator (or lift, if you're British). 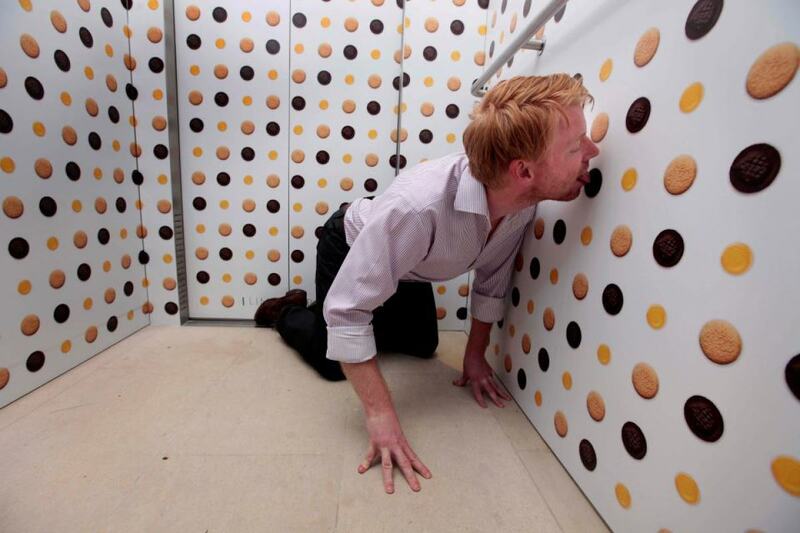 Exactly 1,325 lickable McVities Jaffa Cakes were recently installed on on the elevator's walls. It took food technicians and artists four weeks to develop. “We are all about bringing a bit more fun to life and this was the perfect way to get a little joy straight to stressed out office workers,” Philippa Tilley, Senior Brand Manager from McVitie¹s Jaffa Cakes, told The Drum. And, if you are worried about those germs, don't fear -- once a Jaffa Cake is licked, it is removed from the wall.